Cost to repair carpet varies greatly by region (and even by zip code). Get free estimates from carpet installers in your city. Cost to repair carpet varies greatly by region (and even by zip code). If a seam in the carpet is coming unglued and starting to stick up or roll, all that needs to be done is to re-glue or re-tack the carpet. This can cost as little as $20, or up to $100 for professional help. The DIY version can cost as little as $15-$20 for carpet dye, while professional help can easily cost $200-$300. Basic carpet cleaning averages $60 per 12'x18' room. 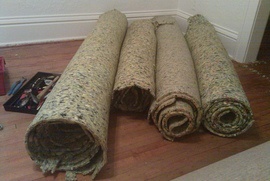 Replacing carpet padding 1 averages $8-$12 per square foot. How much does it cost to repair carpet in my city? Cost to repair carpet varies greatly by region (and even by zip code). To get free estimates from local contractors, please indicate yours.